As I recently learned while trying to start up my own business, finances are hard. REALLY hard. I mean, I’ve written software and compiled custom kernels and built unique Linux systems for years, but trying to track assets and liabilities and equity and invoices and balance sheets… it’s just beyond me, and I need software to help. Judging by the sheer number of financial applications online, I’m certainly not the only one. 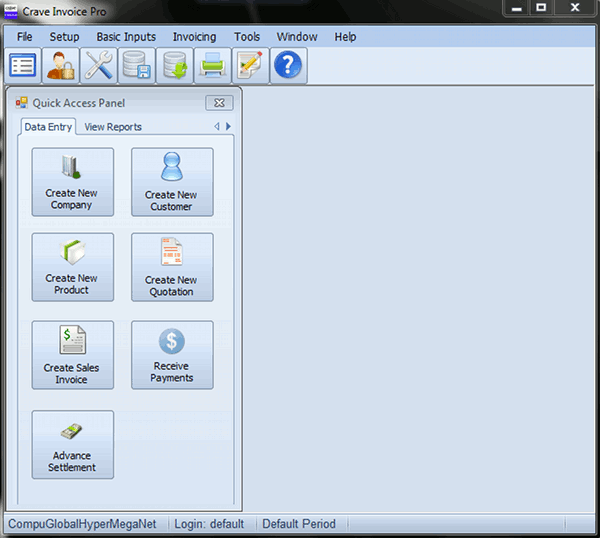 I went in search of software to make things easier and one I came across was Crave Invoice. While not specifically intended for my type of business, I wanted to give it a shot. Here’s that experience, both the good and the bad. 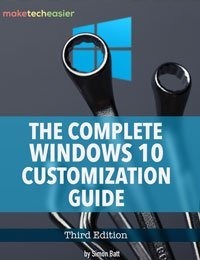 This is a Windows application and comes in three versions – Pro, Enterprise, and Ultimate. Each builds on the last, so where Pro includes invoicing along with customer and product management, Enterprise adds inventory management and Ultimate includes all of Enterprise plus a plugin for managing production. All versions have a 30-day free trial where you can decide if you like the program before purchasing a license. 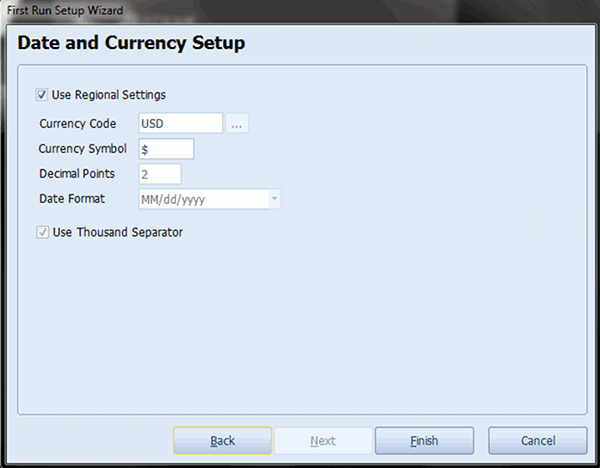 As a Windows program, it installs like any other, and you’re greeted on the first run with a brief 3-step wizard to enter company information and, optionally, tax and currency info. As far as wizards go, this one’s quick and simple, and I appreciate that you can choose to skip the tax and currency screens once you’ve completed the initial company info screen. In short, it’s telling me that I did not enter a ZIP code (not applicable in UK). 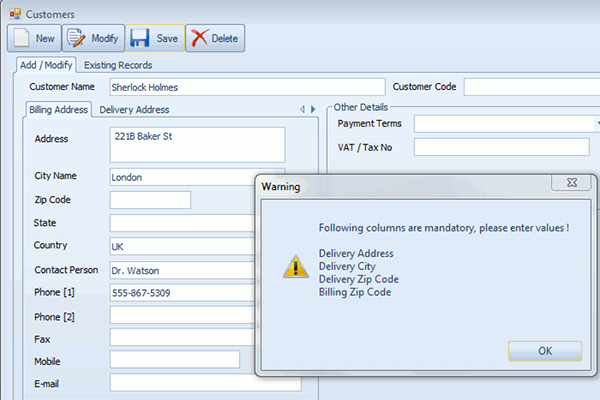 It doesn’t like that I did not enter any information for delivery address (in the next tab over). Crave did accept a London-style postcode in the ZIP box, and I was able to set the delivery information to Same As Billing Address so this was not a deal-breaker, but I can’t predict how the system might respond to countries without a ZIP equivalent. As deliveries have nothing to do with my business, and many others, I was a bit surprised that the Delivery tab would be a required field. To simplify your bookkeeping, you can specify individual products and their prices with Crave and easily add them to your invoices later. 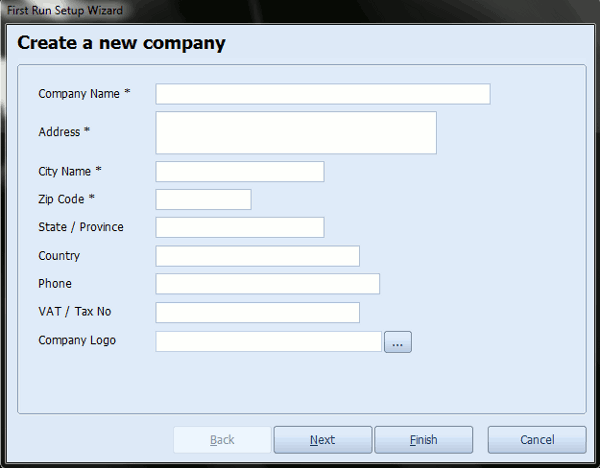 Just choose the Create New Product button from the Quick Access Panel. While it’s one relatively small portion of the overall application, I actually had two complaints about this section. The first is the lack of a description field, or any other way to include additional info/comments/notes about a product. Second, the Units of Measure field provides four options – NOS, KGS, LTR, and MTR without any tooltip or other information about exactly what those mean. From the looks of it, I’d think those might mean number of units, kilograms, liters and meters but there’s no clarification in the GUI or even the online docs to confirm that. A Google search for those terms brought me to a Foreign Trade Department website which confirmed my suspicions, but the software shouldn’t necessarily assume I’m up on the latest FTD abbreviation standards. Surely, if there’s one place this software should shine, it should be invoicing. Why else put that in the name? For the most part, I’d say it’s justified. Crave makes it easy to pull up customer and products and combine them into a simple-to-use invoice generator. 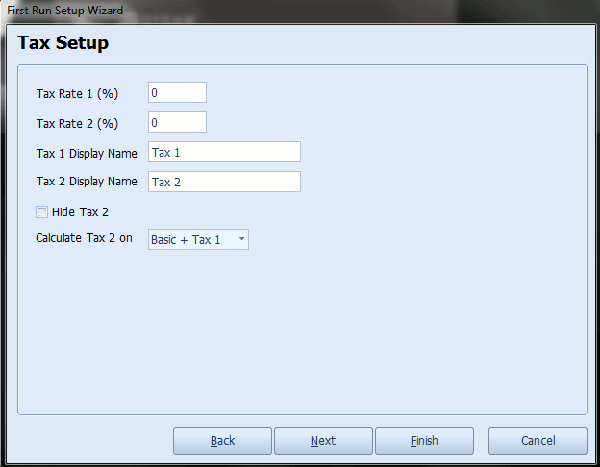 This screen contains all the invoice generation options I need (plus a few more) and is fairly straightforward and intuitive. 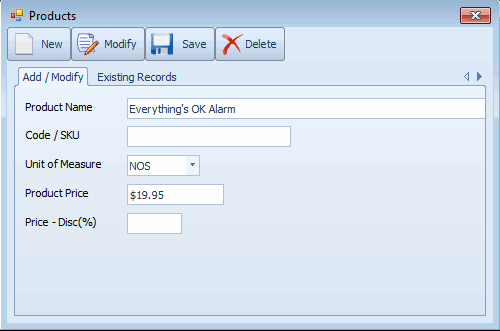 Once I finished entering my invoice details, I hit a snag which very nearly caused me to completely dismiss Crave as useless – until I realized it was another GUI “quirk”. If you look at the above screenshot, you might notice two important things missing. 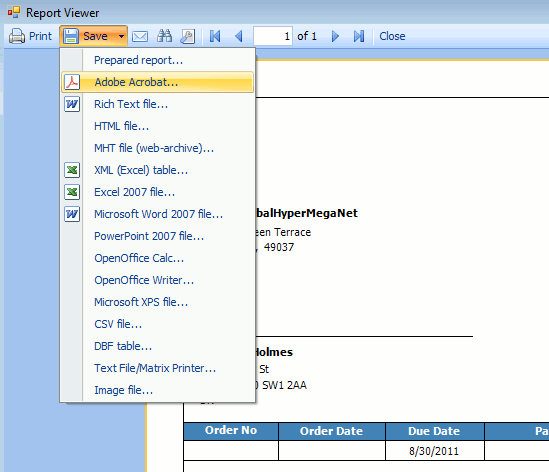 You can print, but there’s nothing to email your invoice, or export it to a file! All is not lost, however, as both those functions are present, but for some reason they’re both hidden behind the Print button. Click that, and you’ll see a preview window which DOES have the controls to email and export. It’s hard to nail down a single, solid opinion about Crave Invoice. 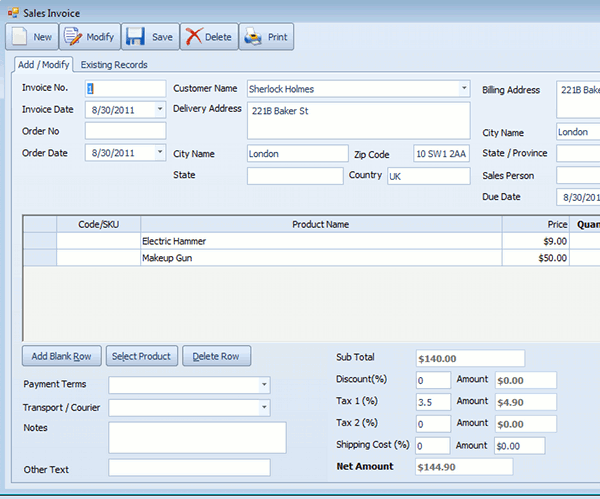 Its primary focus – creating simple and nice-looking invoices, it does well. The graphics are good, but there are some downright silly usability choices (such as loading all screens into one overlapping space with no tabs/tiling/other sane organization). There’s very good reporting capabilities, but the usability troubles make it difficult to want to take advantage of that. I suppose if I had to sum it all up, I’d say that Crave Invoice has some pretty impressive functionality, but lacks quite a bit in form. It appears to be designed for a somewhat limited type of business, but for that type (small manufacturing) it could be extremely useful, provided you can get past those quirks. This giveaway begins now and ends Sunday, 4th September 2011 at 2359hrs Pacific Time. The winners will be selected at random and announced via email. MakeTechEasier would like to thank craveinvoice.com for their generosity in sponsoring this giveaway. Interested in sponsoring? We’d love to hear from you. Get in touch with us.